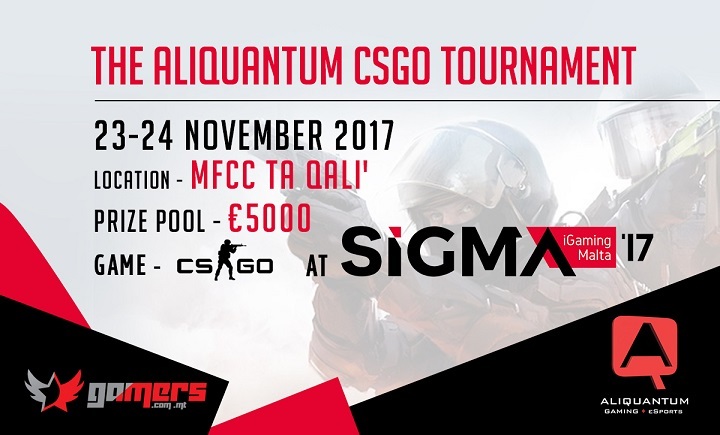 Once again, Aliquantum Gaming are hosting another CSGO tournament during this years SiGMA 17 iGaming conference which is going to be held between the 23rd and 24th of November at the MFCC in Ta Qali'. The event will have the exact same format as last year, were you can show up with your friends and we'll mix you with random players for a chance to take home €5000 in cash prizes. It's important to bring with you your gaming peripherals since we will be providing you with a gaming PC, an AOC 144Hz monitor and also a Gt Omega Racing gaming chair to game comfortably on. Keep in mind that this event will once again be FREE of charge so if you're planning to attend, please let us know beforehand since we only have 40 slots available. To reserve a place you can contact us through the gamers.com.mt Facebook page or by sending an email to tournaments@gamers.com.mt. Last years setup during SiGMA 2016. Hope you like the futuristic setup for SiGMA 2017! Let's make this event another one to remeber and who knows, you might be lucky enough to go back home with your wallet full of cash! The VulkanBet Invitational is a $20,000 CS:GO tournament. It has GSL style groups with a bo3 playoff. The invitational has 8 teams competing across two groups. VulkanBet Invitational Group A consists of Virtus.pro, LDLC, ex-3DMAX, and Nemiga. Group B has Alternate aTTax, Epsilon, Havu, and SJ. As you might see from the teams here, it is a good mix of the veteran players and rising talent. For example, a team like Virtus.pro are part of this old guard. It no longer includes players from the golden five, but they still have individuals like Snax and Byali. It should be a formidable roster, but they have been on a downward trajectory. They are the worst ranked team in the event, being placed at 87th in the world. An invitational like this is a great way to prove they are still capable of competing. As for rising talent, Epsilon is one of the teams that comes to mind. After their performance at Charleroi Esports, they have garnered attention from the community. This mixture of old, young, new, experienced and inexperienced is simply delightful. The Vulkanbet Invitational is the right battleground to show a team’s expertise. VulkanBet Invitational Group A Opening Matches ex-3DMAX vs Nemiga The first match of the VulkanBet Invitational Group A. The number one team in Belarus going up against the 3rd team in France. However, these are two teams that lurk in the shadows of tier2/tier3 Counter-Strike. They tend to compete against a similar level of opposition. So no wonder that their most played maps include inferno, Dust2, and Mirage. For this particular match, the veto landed on Mirage. This is a map both teams tend to leave open. Its something you can pick-up on their veto’s. It will come as a first ban, only when the opponent they are playing against is a specialist of Mirage. In other cases, they leave it as a decider or allow a lesser opponent to pick it. As the battlefield was set, ex-3DMAX came out swinging. They had a very aggressive terrorist side approach. They wouldn’t be phased by any molotov’s or smokes from the Belarussians. The Frenchmen would hit a site guns blazing and the cts had a difficult time. Once Nemiga began abandoning mid presence and focusing purely on the sites, that’s when 5 rounds where won. Things didn’t get much better for Nemiga on the terrorist side. Ex-3DMAX won the opening pistol round and secured a flurry of rounds to 15. After a brief 4 round stint from Nemiga, ex-3DMAX secured a 1v1 to win the Mirage 16-9. LDLC vs Virtus.Pro The LDLC roster is a newly established team. Yet, the composition is looking somewhat weird. You have 3 possible in-game leaders, that’d be MAJ3R, Happy and XMS. There also doesn’t seem to be a star player on their team. Maybe, they’re hoping that Roden, the newcomer, fills the igl shoes. On the other hand, you have Virtus.pro, who have made massive roster changes themselves. They’ve now added Vegi, a player from another Polish team called Pact. From what we’ve seen of him at Charleroi Esports, he had a good individual performance. That’s a good sign for this Polish team. As the veto took place, the teams landed on Nuke. This is a map Virtus.pro have tried playing in the past but lost 4/6 times they played. They’ve lost to Nemiga, Sprout, and Optic, just to name a few. For LDLC this was their first official match Nuke, so it was hard to grasp their level on the map. Nonetheless, the Frenchmen had a good start by winning the pistol round. But their success didn’t last too long. Virtus.pro began exploiting the upper bombsite defensive, which wasn’t held properly at the start. Once the members of LDLC realized what was going, VP began changing their avenues of attack. This led to a tight scoreline between the two teams. But for a lot of the half, the ct side of LDLC was struggling in the money department. This led to a half score of 9-6 in favor of VP. Then it was a matter of closing out the game for Virtuus.pro. But the French showed resilience and even tied the scoreline 10-10. But alas, once VP had their cash flow secured on the ct side, they began winning consecutive rounds in a row. This led to the eventual victory of 16-12. VulkanBet Invitational Group A Winner’s Match ex-3DMAX vs Virtus.pro These are two teams that won their opening matches at the Vulkanbet Invitational Group A and were fighting for a slot in the playoffs. The stage was set and Nuke was the deciding map. The French started things on the ct side, while the Poles where on the terrorist side. Even after losing the pistol round, ex-3DMAX got up to a nice 4-2 lead. But the half score was close between the two teams. As the half ended 8-7 in favor of the French, the real fun would begin on the 2nd half. Ex-3DMAX had a similar style at play, as we saw in the Mirage game against Nemiga. Ex-3DMAX were very quick on their aggressive pushes. This allowed securing an impressive 15-9 lead. This is where the French needed one more round and they win the game. But on the 25th round, we witness a whacky push from the French. They had 4 players coming out of the orange squeaky door on the upper bombsite. They were easily shut down by VP and afterward, they began winning round after round. Suddenly, the scoreline was 15-15. Overtime was a truly enthralling affair. Individual performances were the main reason for a team’s success. Even though Snax won an impressive 1v2 on the upper bombsite on the ct side, it was no match for what the Frenchmen pulled off on their ct side. With an AUG in hand, DavidP shut down 4 players in the outside area. In the last round of the game, we saw Hadji pick up 3 kills with the awp, whilst holding A. These performances led to an ex-3DMAX victory at 19-17. VulkanBet Invitational Group A Elimination Match Nemiga vs LDLC A do or die scenario for both teams. But an important match for the Frenchmen. Could this possibly be another event where they finish dead last? It turned out that the map shall be Inferno. Nemiga have got a lot of experience on Inferno. This is their most played map in online Counter-Strike with a win percentage of 57% these past 3 months. LDLC, however, have played the map in Charleroi Esports. But it was a lackluster map. They lost it 16-4 to Sprout and made a comeback against the inexperienced team FrostFire to secure a 16-14 score. Pretty early on the French had a difficult time on the terrorist side. They’ve tried time and time again to change up the pace. But they would hardly get comfortable, as Nemiga had a very aggressive ct side. And that aggression would always net them an early kill. It was a bleak half for the Frenchmen and the game ended 16-4 in favor of Nemiga. It is important to note that both Nemiga and LDLC had to resort to stand-ins. That’s something to keep in mind when talking about the result. The Decider Nemiga vs Virtus.pro The final match for the Vulkanbet Invitational Group A. The winner can proceed to the semi-final, whilst the loser is out of the tournament. There’s a lot at stake for the two teams. Even in a scenario like this, it’s hard to predict who can win. Not too long ago, Nemiga secured a 2-0 victory against the Virtus.pro roster in a one-sided fashion. When Nemiga was given the opportunity to choose between Overpass and Inferno, they chose the latter. The Polish team had a solid 3-0 start on the terrorist side. Then slowly but surely Nemiga began picking-up a lot more rounds in a row. However, they couldn’t go for the same aggressive tactics as they did in the LDLC game. They were punished more often, thus it was a more of a passive hold. Things were looking pretty good for Virtus.pro, but then they lost some massive rounds. First was the eco from Nemiga and then the 1v3 from lollipop21k on the B bombsite. This made the half 9-6 in favor of Nemiga. The Polish side had a swell start on the ct. Things were looking up, but then the Nemiga shifted into 5th gear. They won the last couple of rounds and secured Inferno 16-12. Concluding Thoughts Those were the matches for the first day at the VulkanBet Invitational. As expected, a team like ex-3DMAX was able to push through to the playoffs without dropping a map. But it’s a somewhat dissatisfying affair for a team like LDLC. The first loss against Virtus.Pro on Nuke was still somewhat close. Yet, there’s very little to defend them in the game against Nemiga. There didn’t seem to be a lot of team cohesion not to mention proper team play. 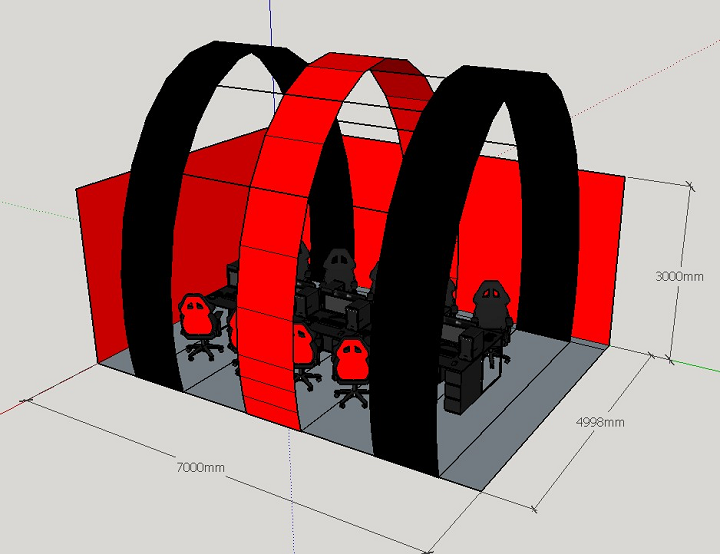 This isn’t a team with some amazing fraggers, they definitely need more time to work on this project. As for Virtus.pro, it’s another exit in the early stages of the tournament. This concludes the matches of Group A. Tune in next week to find out who’ll make it out of Group B. The VulkanBet Invitational is an upcoming CS:GO tournament organised by GMR Entertainment that brings together eight teams and gives them a chance to test their skills against some excellent European rivals. Tournament Info The VulkanBet Invitational offers a prize pool of $20,000 and is scheduled to take place between April 17th – 26th. Given the duration of the event, we will probably have the chance to see some good matches and get to learn more about some of the European teams that are on their way to break into the Majors and Minors of CS:GO. In this article, we will give you a better understanding of who these teams are, what they’ve done so far and why they’re worth watching in spite of not being at the top with the likes of Astralis, Natus Vincere or Team Liquid. Some of them you already know if you watch CS:GO, because they used to be among the world’s best just some time ago. Prizes A total of $20,000 in prizes will be shared among the top four participants in the following way: Placement Reward 1st $10,000 2nd $5,000 3rd $3,000 4th $2,000 Participants and Format VulkanBet Invitational features eight teams from Europe. 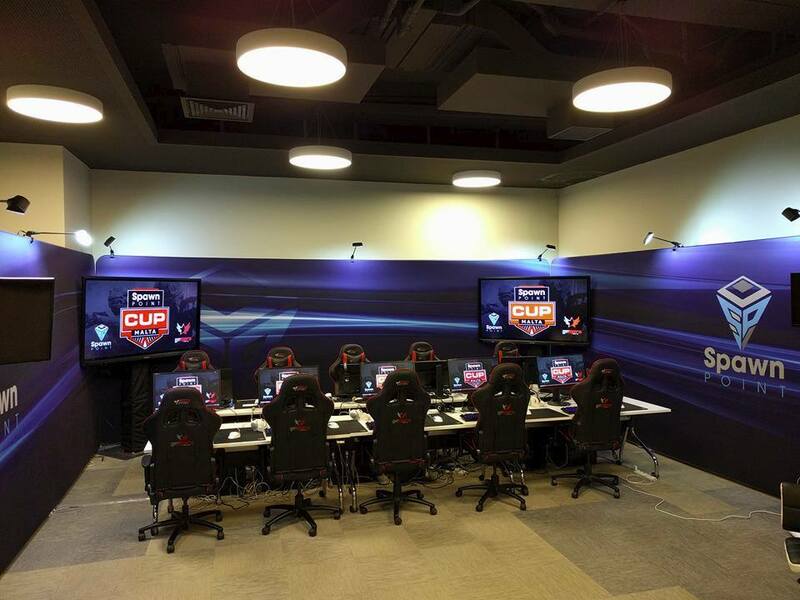 The teams will be split into two groups of four and the GSL format will be used for each of these groups. The Playoffs Stage (April 24th – April 26th) will be played in a Single Elimination format and every match will be a BO3 series. Group A (April 17th – April 18th) Group B (April 22nd – April 23rd) ex-3DMax Epsilon Nemiga Alternate Attax LDLC SJ Gaming Virtus.Pro Havu Team Analysis Be sure to check out the upcoming pages Group A and Group B for a brief analysis of the eight teams that will participate at the VulkanBet Invitational. It was bound to occur; the arrival of a free-to-play battle-royale which would contest with the juggernaut of Fortnite in both spectra of competitive and casual play. It goes without saying, that I'm referring EA's Apex Legends; an engaging mix of pick-a-hero gameplay and other unique mechanics tossed into the recipe of battle-royale. The title has definitely taken the world, and the country by storm; we've realised this. Hence, GMR Entertainment will be capitalizing on the current buzz by offering competitive Apex Legends at our upcoming event; the MCS#5: MRO Edition. The MRO, year in and year out, has always been an opportunity to dig our heels into the ground and push forward with a new titles such as Overwatch, Battalion 1944 and now, Apex Legends. The announcement is probably less of a surprise to most of you, especially those who tuned in to last week's stream hosted by the new Hex Media studio, where we revealed our intentions through a little gameplay of our own. For the tournament; one can expect a format similar to the one utilized by the international Twitch Rivals event: in which teams attempted to score as many points as possible overall through placement and kills. The Apex Legends tournament will be part of the BYOC area, which is a new addition for the first time in the MRO series. With new legends, updates, ideas and tonnes of support from social media and communities, Apex Legends is definitely the 'next big thing' in gaming. However, the cyclic nature of these free battle-royale titles will only become more rapid as developers cram for the spotlight - though, if they keep these titles free and accessible to the community, it's only beneficial to the community. The only drawback, is that the contemporary nature of these battle-royale games, and the fact that attention is being pulled in many directions, makes sustaining a long-lasting and stable esport quite difficult. Ever since winning the Maltese Red Bull MEO Clash Royale Finals and the Qlash Clash Royale Tournament hosted at the Malta Esports Festival 2018, GMR Entertainment has been keeping a close eye on the champion; Angelo anglu Vella. Such attention led up to the fact after he had qualified for the international Red Bull MEO Clash Royale Finals - where he would represent Malta in an international competition, stacking ambassadors from each country across the mobile title of Clash Royale. Apart from the event itself acting as quite the breakthrough for mobile-gaming in general, it was an opportunity for Angelo to show his stock. The international event, involving a total of 36 countries, had been building up ever since September of last year, with qualifiers gradually concluding in each respective country within every continent. With the event including the other titles of 'Arena of Valor' and 'Brawl Stars', the venue was certainly buzzing with excitement, but also tension - $50,000 were on the line on the whole. This mentality was embraced immediately, and it seems that Angelo anglu Vella found himself in quite a tough spot within Group D. Competing against players from America, Mexico, Turkey, Portugal, Greece, Brazil and Egypt, the Maltese competitor would undoubtedly struggle. Anglu tied points with Greece and Turkey, but due to score difference he was placed 7th out of 8 within groups - ending his tournament there. "The Ice" (BR) Vs "Anglu" 3:2 "Sergioramos" (MX) Vs "Anglu" 3:0 "iForg1ven" (GR) Vs "Anglu" 3:1 "lelouch" (TR) Vs "Anglu" 2:3 🏆 "UnstoppableCR" (US) Vs "Anglu" 3:0 "The Awesome" (EG) Vs "Anglu" 0:3 🏆 "RafinhaJr11" (PT) Vs "Anglu" 3:1 Nonetheless, we're very proud of Angelo and we encourage him to continue pursuing this notion of competition - you're only 18 and a plethora of future opportunities will arise; keep striving to compete with others and yourself most of all. The rest of the event concluded smoothly with ThunderStruck from UK being crowned as winner, though we will admit that our peak interest was in the performance of our representative Angelo Vella. One interesting fact is one pertaining to cheating - the French player GregEmpire77, as reported by Dotesports, was competing against a German player within the play-offs, when he was accused of communicating to his manager during the game. He pleaded guilty to the accusation, showing off the AirPods he had snuck underneath his headset, through which his coach communicated to him, selling the lie that all was legal. He was quickly disqualified. With this event being a major primary step in mobile gaming and to witness cheating early on - is the accessibility of mobile phones, leading to a higher susceptibility of cheating, going to be a detriment to future mobile esports? To conclude, we'd like to congratulate Angelo for participating, flying out to an international event and gaining the experience which we wish for him to use to push forward in the scene. Also, we've managed to gain further insight into the mobile esports scene - how long will it take before we start seeing major and headlining events based on a mobile platform? With the end of last, the divisions for the 2019 CWL Pro League were concluded through the Pro League Qualifier event. A total of 16 spots were up for grabs; four of which had already been awarded to the likes of Optic Gaming, Luminosity, eUnited and Splyce following a satisfactory Top 4 finish at the first event of the year; CWL Vegas. The PQL offered some potential shock, as certain 'top teams' began questioning the notion of the 'favourite'; with the lesser known teams snatching a series now and then. A few teams that many thought wouldn't make it were Red Reserve, Team Envy, and of course, the notoriously problematic squad of 100Thieves. Luckily for them, they all managed to make it through; avoiding communal tension and the subconscious screams for a roster change, at least for now. However, one top name did fail to qualify - FaZe Clan. The squad of 'Replays', 'Attach', 'Zooma', 'Priestahh' and the newly added young talent of 'Cellium'; who I personally believed performed very well overall, were kicked out by Excelerate Gaming in the Losers' Bracket. Perhaps this proves that former player Methodz was not completely culpable for their similarly poor performance at CWL Vegas. With the current state of other teams in mind, such as 100T, and the fact that FaZe is one of the top organizations within the Call of Duty scene; I find that a roster change is on the horizon - the players, especially Zooma and Attach, are undoubtedly disappointed in not qualifying for the esteemed league. Another team to also fail their expectations, albeit lower than others, was G2 Esports, captained by Parasite, the BO2 champion. Unluckily for them, they matched up against a desperate Red Reserve - the game between them determined with who would progress and who would go home from the two of them. All live viewers were gifted with a 5 map series, terminated with a Round 11 SnD - Methodz was left alone in a 1v3; it really has been a tough year for the former member of the event-winning Rise Nation of WWII. Anyways, the divisions have been concluded, with the 16 teams grouped up as follows; The open bracket teams of Midnight, Evil Geniuses, Enigma6 and Team Envy all came out swinging and quickly solidified a spot into the Pro League. Some new names, such as Heretics and Team Space act as undetermined threats to the top tier teams. Looking over the divisions as a whole, both are rather stacked; the exact aim of the Pro League. While Division A houses the top-dogs of Optic and Luminosity; it's unsure how these teams will fare against other teams that, although on paper have less stock, have made use of a tremendous amount of practice this past week in qualifying. Personally, I find that Division B is slightly more competitive, with the bottom four splitting hairs, Enigma6 and Envy lacking consistency while eUnited and Splyce juggle for dominance. However, it is imperative to keep in mind the fact that unlike last year's league, teams in different divisions will have the opportunity to play one another this year. With schedules and specific matchups to be released, it'll be curious to witness how these cross-division matches play out. With $700,000 on the line, the first week kicks off with the 4th of February. All the action will climax with the awaited play-offs. Until then, many teams such as FaZe Clan await impending departures of professional players who wish to compete in the Pro League, to give an example of such a team. A similar situation is being faced by G2 Esports and Team Sween, to note. The newly updated season of Trading Shots, hosted by CWL, will be sure to break down all of the latest news - personally a massive fan since its introduction last year.